Amerton (near Stafford). 2 ft (610 mm) gauge railway about 1 mile (1.6 km) in length, located at the Amerton Working Farm. Steam and diesel hauled. Apedale Heritage Centre, Newcastle-under-Lyme. Heritage Centre to Apedale Road, a little over ¼ mile (0.5 km). Extension proposed to Miry Arena, a further ¾ mile (1.4 km). 2 ft (610 mm) gauge, steam and diesel hauled. Dudley. 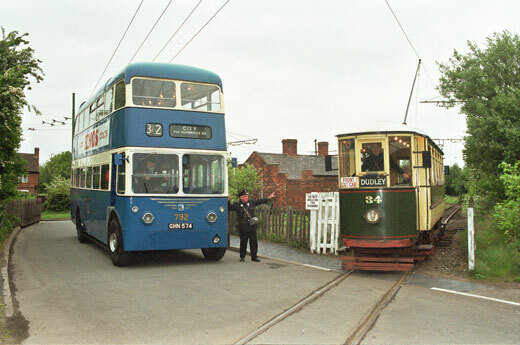 The museum includes a 525 yard (480 m), 3 ft 6 in (1067 mm) gauge electric tram line. Part of the Ironbridge Gorge Museum complex. Includes a narrow gauge railway recreating a typical mine railway, and a funicular or “incline lift”. Bridgnorth: cliff railway joining the Low Town and the High Town, with a rise of 111 feet (34m). The only inland cliff railway in England. Brownhills West (near Walsall) to Chasetown Church Street, about 2 miles (3.2 km), in the Chasewater Pleasure Park on Cannock Chase. Standard gauge. Steam and diesel hauled. Kingsley & Froghall to Leek Brook, the principal station being Cheddleton (near Leek), 5¼ miles (8.6 km). On certain days trains continue from Leek Brook to Cauldon Low, a further 8 miles (12.9 km). Extension planned from Leek Brook to Leek, about a further 1 mile (1.6 km). Possible future extension from Kingsley & Froghall to Oakamoor, a further 2 miles (3.2 km). Possible involvement in the projected reopening of the line from Leek Brook to Stoke-on-Trent, about 12 miles (19 km). Other proposals include extending from Oakamoor to Alton Towers, and reopening the branch from Cresswell to Cheadle, Staffordshire. Standard gauge. Steam and diesel hauled. Dining trains operate at certain times. Lydney Junction (near Arriva Trains Wales Lydney station) to Parkend, the principal station being Norchard. 4 miles (6.4 km). Possible future extension to Speech House Road, a further 2¼ miles (3.6 km). Standard gauge. Steam and diesel hauled and diesel railcars. Dining trains operate at certain times. The Polperro Express 2 ft (610 mm) gauge line circling the park, with its main station in the Fisherman's Wharf area. Diesel hauled, steam outline locomotive. Thomas Land Railway 2 ft gauge line about 550 yards (500 m) in length, linking the museum / zoo area with the Thomas Land section of the park. Diesel hauled, steam outline locomotives based on the Thomas the Tank Engine character. Bodymoor Heath, near Sutton Coldfield. Steam and diesel hauled miniature railway located in Kingsbury Water Park. 7¼ inch (184 mm) gauge miniature railway about 1¼ miles (2 km) in length. Steam and diesel hauled. Twyford, near Evesham. 15 inch (381 mm) gauge miniature railway located in The Valley. Line about 1200 yards (1100 m) in length. Steam hauled. Caverswall Road station, Blythe Bridge. Line about 2½ miles (4 km) in length. Standard gauge. Steam and diesel hauled. Also a Miniature Railway at Caverswall Road station, line about 950 yards (870 m) in length, 5in (127 mm) and 7¼ in (184 mm) gauge, steam, petrol or battery electric hauled. Cheltenham Racecourse to Laverton: 11½ miles (17.7 km). Extension under construction to Broadway, a further 2¼ miles, (3.6 km). Possible future extension to Honeybourne. Standard gauge, steam or diesel hauled. Leasowes Park, near Halesowen. Line about 250 yards (230 m) in length. 7¼ in (184 mm) gauge, steam or petrol hauled. Perrygrove (near Coleford, Forest of Dean) to Oakiron: ¾ mile (1.2 km). 15 inch (381 mm) gauge. Steam hauled. Rudyard (near Leek) to Hunthouse Woods: 1½ miles (2.4 km). 10¼ in (260 mm) gauge. Steam hauled. Kidderminster to Bridgnorth: 16 miles (25.7 km). Standard gauge. Usually steam hauled with some diesel services. Dining trains operate at certain times. Also the Coalyard Miniature Railway at Kidderminster station, line 500 yards (450 m) in length, 7¼ in (184 mm) gauge, usually steam hauled. Near Tamworth. Private railway open to the public on certain days, visits must be booked in advance. The main line (Field Railway) is over 3 miles (5 km) in length, dual 2 ft (610 mm) and 2 ft 6 in (762 mm) gauge. The Garden Railway has 2 ft (610 mm), 10¼ in (260 mm) and 7¼ in (184 mm) gauges. The Burton & Ashby Tram, a former electric tram converted to operate with a diesel generator, runs on its own 3 ft 6 in (1067 mm) gauge line. There is also a short standard gauge (1435 mm) line. During the summer months, but not when the line is open to the public, the Field Railway is used for the transport of harvested crop seeds (borage, camelina and flax) from the fields to the Grain Store. Lawley Village (near Telford) Horsehay & Dawley or Spring Village: each about ½ mile (0.8 km). Spring Village is currently the principal station but it is proposed to extend facilities at Lawley Village to allow park and ride. Extension under construction to Doseley (a further 1 mile, 1.6 km) and proposed to the site of the former Ironbridge Power Station. Standard gauge. Steam or diesel hauled. At Spring Village there is also a unique ¼ mile (360 m), 2 ft (610 mm) gauge steam tram line and a miniature railway. Toddington. Line about ½ mile (0.8 km) in length starting from the Gloucester Warwickshire Railway station site. 2 foot (610 mm) gauge. Steam or diesel hauled. alongside the lake in Trentham Gardens. Line about 700 yards (630 m) in length. 7¼ in (184 mm) gauge, usually petrol hauled with occasional steam haulage. Besides other excursions, the company operate the Shakespeare Express,a Summer Sunday steam train service over the Network Rail line between Birmingham Snow Hill station and Stratford-upon-Avon (25 miles, 40 km), calling at Tyseley for the Birmingham Railway Museum. Weston Park, near Shifnal. Line about 1¼ miles (almost 2 km) in length. 7¼ in (184 mm) gauge, diesel hauled. at Woodseaves Garden Plants, near Market Drayton. Line about 450 yards (410 m) in length. 7¼ in (184 mm) gauge, steam or petrol hauled. at the Transport Museum, Wythall, Birmingham. Various lines and gauges, various locomotives. Club railway open to the public for special events.